Seven years ago I began writing about Halloween, horror movies, and haunted attractions purely out of love for all things spooky, creepy, and macabre. It’s something I developed a fascination with when I was a child. My family lived on London Street in Lincoln Park where my brother and I enjoyed creating dummies from our grandfather’s old work clothes and along with our sisters played haunted house in our basement. That love for the fall season has stayed with me my entire life and I consider myself fortunate for having the opportunity to have met and conversed with so many who share that same passion; and I owe much of that to the entries in this blog. Inspired in part by Zioptis, this is something I began to do for fun. As time passed I began to get responses from haunt goers, owners, and actors who all enjoyed my writing. I found it rewarding to have that level of interaction. 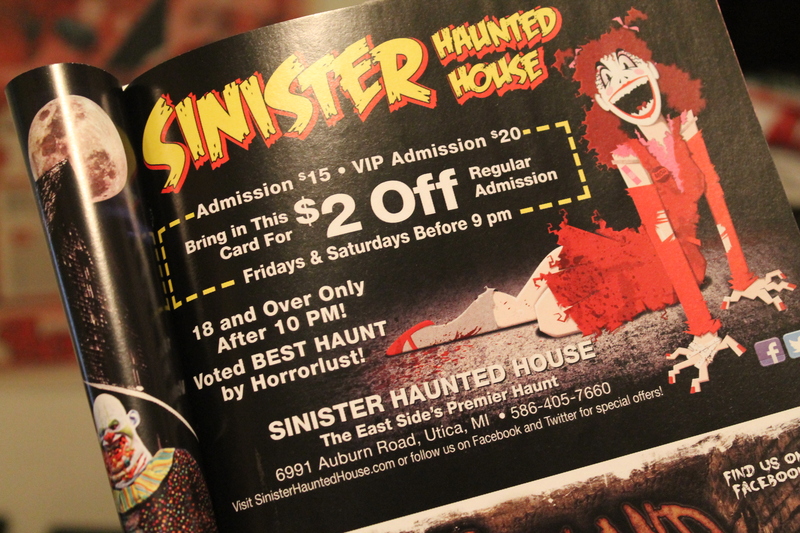 A few weeks ago, while flipping through the Haunt Guide, I discovered that Sinister had made mention of this blog in their ad. I got a real kick out of that and I’m not embarrassed to admit that it filled me with a sense of pride. Recently, after learning of this, my mother-in-law suggested I start promoting this blog in earnest and so I decided to have some business cards printed. I have no idea where this journey through monster infested corridors will lead me but I’ve enjoyed the trip thus far and have no plans to turn back. I can’t help but follow my heart, it just feels right. 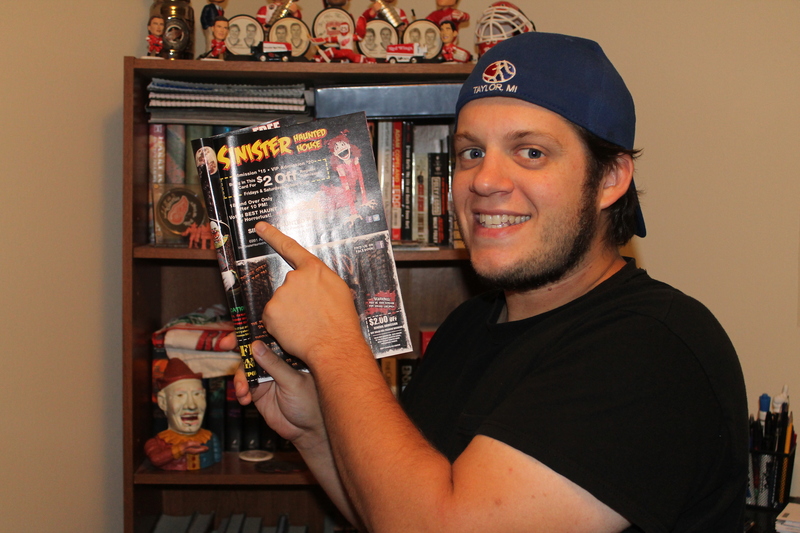 Here I am mugging for the camera with the Sinister ad. As you may have surmised from the background I’m also a fan of the Detroit Red Wings. A close up of the ad where you can actually see the phrase Horrorlust. 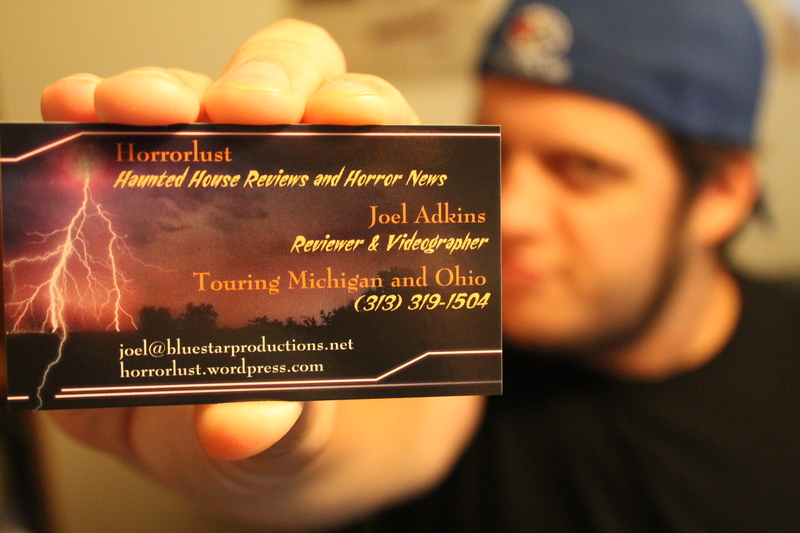 The official Horrorlust business card. Coming soon to a haunt near you! Yesterday, I wrote briefly about the fabled Demonic Demons and the possibility that Zioptis had found a worthy successor — the news, as far as Michigan haunters are concerned, will undoubtedly be disappointing. The haunt in question is located in New York City, firmly outside most haunters seasonal bounds. The attraction is called Blackout and from what I’ve read it’s more in line with psychological theater than it is a traditional haunted house. Haunters must be over the age of 18 to enter the attraction and are required to sign a waiver, the real kicker however is the fact that guests are required to brave the darkness alone. That last fact is certainly an intriguing twist but I can’t help but to wonder if such a strategy would ultimately hurt the bottom line. A large draw of haunted attractions is the shared experience, it’s fun to go on an adventure with friends and have stories of laughter and fright to kick around for years to come. But as I’ve already mentioned, Blackout is not a typical haunted attraction. The website for Blackout warns of physical contact, sexual and violent situations, water, and crawling. Apparently haunters are provided a flashlight and a medical mask that must be worn, guests are instructed to shout “safety” if they feel overwhelmed and wish to end the journey but other than that no speaking is aloud. The premise is raw and from the reviews I’ve read the experience sounds primal. A couple of reviewers commented that the experience were as if they had become a participant is a sick game straight out of Saw. The website does state that guests will engage in certain scenes where participation in disgusting or uncomfortable activities is required. The whole affair certainly sounds interesting and darkly seductive. I can’t say for sure whether or not I’d go to an a attraction such as this if there were one close to home but I’d definitely consider it. Blackout does indeed sound as if they’ve taken the approach employed at Demonic Demons to another level, as Zioptis first suggested.